The Global Ethics Forum 2015 was held at the Ecumenical Centre in Geneva, Switzerland, on 25-27 June. The 150 participants came from all over the world to discuss "Responsible Leadership in Action: The Value of Values". In addition to plenaries and panels, there were 12 workgroups that met three times to discuss tools and prepare projects to implement them. 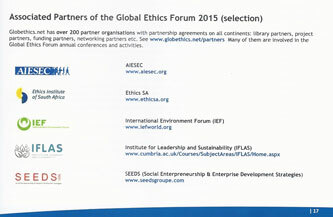 The International Environment Forum has been an Associated Partner to Globethics.net and the Global Ethics Forum for several years, and it was one of five such partners (out of 200) to have its logo featured in the conference brochure. ebbf - Ethical Business Building the Future is also an associated partner. IEF was represented this year by Arthur Dahl and Joachim Monkelbaan, and ebbf by Nauman Hussain and Caroline Zagrecki Sawicki. The World Happiness Report 2015, released on 23 April 2015, looks at the changes in happiness levels in 158 countries, and examines the reasons behind the statistics. The WHR demonstrates that well-being and happiness are critical indicators of a nation’s economic and social development, and should be a key aim of policy. The UN Major Groups Programme Coordinator in the Division for Sustainable Development requested stakeholder feedback regarding the UN Statistical Commission's technical report on indicators for the Sustainable Development Goals, which are to be adopted in September. The IEF submitted the following comments on the technical report in the limited space provided. The International Council for Science, in partnership with the International Social Science Council, have released a report which provides an independent review of the 169 targets under the proposed Sustainable Development Goals (SDGs), which are set to be approved at the General Assembly of the UN in September 2015. On Sunday, 1 February 2015, Paul Hanley, author of the insightful new book, Eleven, presented a webinar lecture in Washington, D.C., USA, hosted by the U.S. Bahá’í Office of Public Affairs. Drawing on the material in his book, Mr. Hanley discussed how humanity and the world will adjust to support 11 billion people by the end of this century and how we can and are beginning to cure the social and environmental ills currently plaguing humanity and nature. As part of his talk, Mr. Hanley emphasized a solution rooted in local education and capacity-building processes practiced in the Bahá’í community. A recording of the talk with slides was available, but has unfortunately been lost. More than 100 individuals took part in the event and feedback was very positive. As the Sustainable Development Goals and targets go through governmental review and approval this year, one area of unfinished business is to identify the indicators that will be used to measure progress towards the ambitious goals for 2030. The SDSN has taken up the challenge, and its report proposes 100 global indicators for the 17 Sustainable Development Goals (SDGs), to be calculated for all countries, as well as 141 complementary national indicators to be used on an optional basis depending on the national situation and priorities. 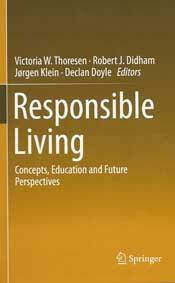 All the global indicators are discussed in detail for methodology, data availability, and responsible organizations. The aim is to provide the scientific backing for decisions governments will take this year to adopt the SDGs, to be ready to start implementation in 2016 of at least a partial set of indicators ready for use. The revised working draft was open for two weeks for expert comments, and IEF submitted a short version of its analysis below.